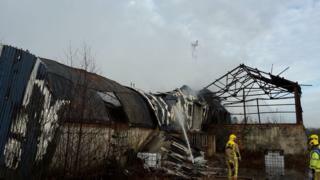 A company and its two directors have been charged with environmental offences after a major factory fire two years ago. About 1,500 tons of recycled waste went up in flames in February 2017 at Hanbury Plastics Recycling (HPR), in Redhills Road, Milton, Stoke-on-Trent. HPR Stoke, Richard Devine and Michael Charles appeared at North Staffordshire Justice Centre on Monday. The case was adjourned for a further hearing at the court on 8 April. Mr Devine, 59, of Fletcher Drive, Altrincham and Mr Charles, 66, of Ouragh Court, Tullow, County Carlow, Ireland, have both served as directors of HPR. Both men and the company face a charge of breaching an environmental permit and one of improperly storing controlled waste at the site between 27 May 2016 and 9 December 2016. The court heard HPR Stoke is currently in administration, the Local Democracy Reporting Service said. Prosecutor Adam Hazelhurst said: "The position is this, we have three defendants, including a company that is in administration. "I have spoken to the administrator and it looks like the company will be dissolved in about three months." Mr Hazelhurst asked for a six-week adjournment to allow for defence lawyers to consider 'three or four lever-arch files' worth of evidence'. A spokesman for the Environment Agency, which brought the charges, said: "As this is an active and ongoing court case, we will not be able to comment at this time."